The nanoblock Space Center set comes in a small box packaging, with over 580+ pieces of building blocks, and a sheet of instruction paper to show you how to build a space center complete with the launch platform, space shuttle and booster rockets. The blocks and instruction paper. That's over 580+ blocks. This is a "Level 3" nanoblock set, so it's moderately difficult to put together. It took me around 50 minutes to put it all together. The space shuttle and booster rockets are relatively easy to assemble. The tower however, requires a more delicate touch. Do take the time to assemble the tower carefully, making sure each level is properly build before adding the next. Be careful not to exert too much force when adding each level, or you might just bring the whole tower crashing down. Here are some pics of the build process. And here is the fully assembled space center. It stands at about 20cm tall. 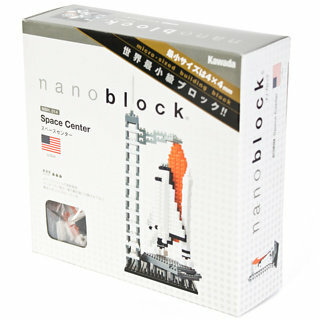 The nanoblock Space Center set retails at RM79.90, and you can get them from Toys R Us, Action City, Kinokuniya, Popular Bookshop and XL Shop in Malaysia now. You can also find it in my Amazon.com store. If you are on Facebook, do follow Chris's Nanoblock Blog page on Facebook to get all the latest updates.